...is a great unit if you want to learn a little bit of art history! And if you like your young artists to have FLEXIBILITY OF CHOICE within a given project, this is definitely a unit you'll want to try!! This series contains 4 full-length lessons, plus a bonus lesson! A MASH-UP is defined as... "something created by combining elements from two or more sources, such as a piece of music created by digitally overlaying an instrumental track with a vocal track from a different recording." In Famous Artist Mash-ups, we examine the distinct styles of two different artists and combine elements of each into one amazing artwork! 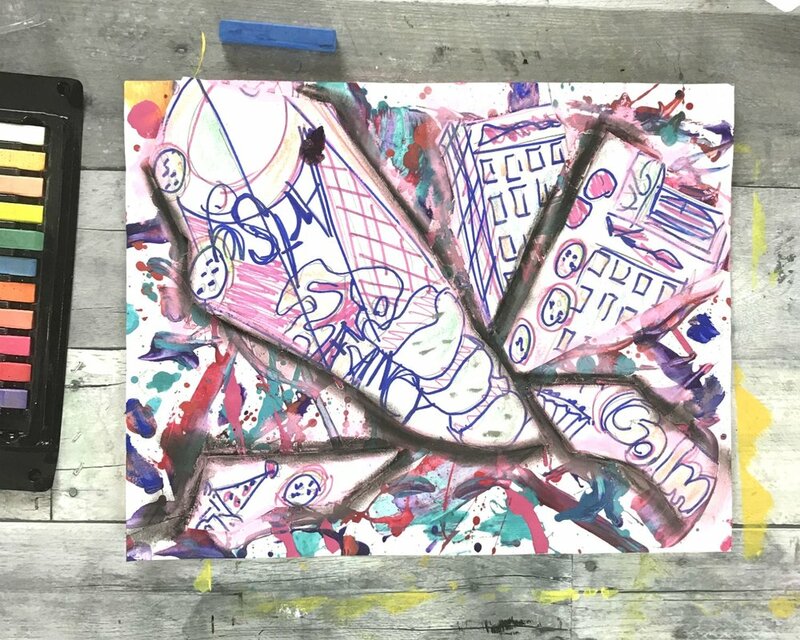 So for every project in this unit, you'll be learning about two different artists, their unique styles of art-making, and the historical art period that shaped them! 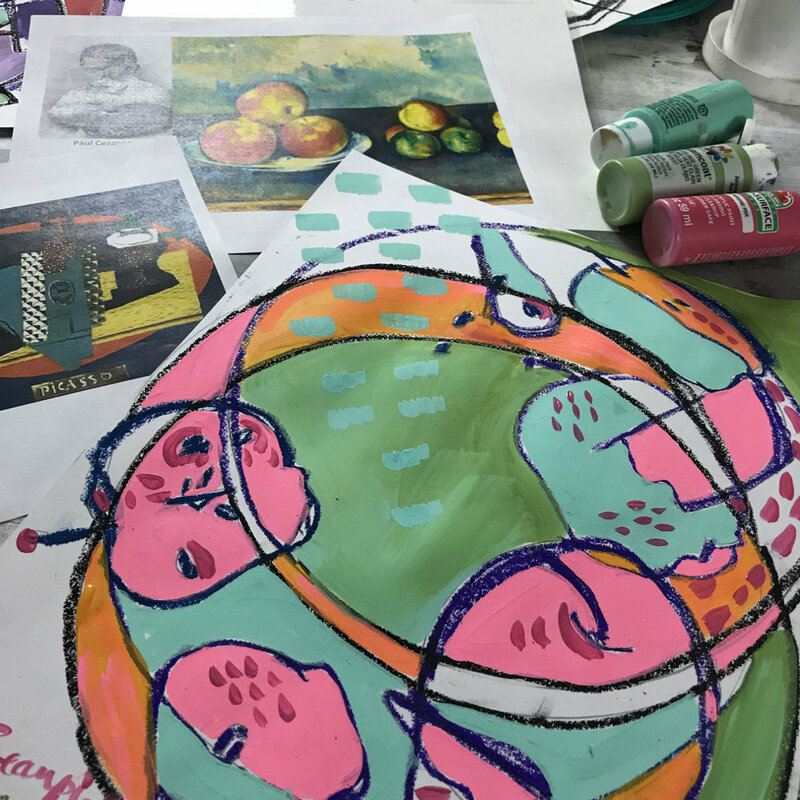 Every project in this unit includes step by step video instructions to guide Project Artists along, plus a separate video discussing important facts about the two artists. Discussion prompts so students can interact with the course material and even upload a picture of their completed project! Your Project Artwork Club Membership gives your Project Artist access to everything within Famous Artists Mash-Ups plus access to all other series in the Project Artwork at Home library! Famous Artist Mash-Ups introduces young Project Artists to 10 Famous Artists and gives them the opportunity to experiment with a variety of styles! Besides the great history integrations, Project Artists also get to learn a bit of science as we discuss parts of a flower and pollinators in the Van Gogh, O'Keefee Mash-Up. Dürer- Seurat Bunny-- students can make their bunny any color they choose and will create their own unique setting for it. Cezanne- Picasso Apples- students are building their own composition; how many plates, apples, apple slices and pieces and where these are drawn all over the page, plus the colors they choose...all entirely up to them! Mondrian- Matisse Abstract-- I offer several options for the black lines...everything from printing to cutting and pasting. And the Matisse shapes will be completely designed and painted the way they want. And the Chagall- Pollock Mash- Up completely revolves around Project Artists drawing a variety of items that are uniquely significant to them and coloring them however they wish. To get started with Blobs, join the Project Artwork Club! Your Project Artists will get access to all the Blobs Project Lessons, as well as the lessons in all other Project Artwork Series!